Enter a land of remote villages, ancient customs and myths of Dracula on this trip to discover walled medieval towns and painted monasteries. See the towering peaks of the Carpathian Mountains and cruise along the pristine waters of the Danube Delta. Arrive in Bucharest and meet the group. Bucharest is Romania's largest city and became the capital in 1832. In the past Bucharest has been thought of as somewhat drab and dull, but thanks to a period of urban renewal and modernisation, it's now a bustling city at the centre of Romanian culture, art and media. On all our trips to Romania we use minibuses to get around. Many of the roads in the Romanian countryside are twisty and narrow and the road surfaces can be poor in places, so by using these smaller buses it means that we're able to access areas that the larger coaches can't get into. The minibuses usually have around 20 seats with two next to one another and then a single seat on the opposite side of the aisle and four along the back row. The seats are comfortable and equipped with armrests and seat belts. There's normally a rack for day bags and coats above the seats and the main luggage is stored in the rear boot. Leg room is however less plentiful than on a full size coach. There are a few photographs of the type of minibuses used within the image gallery tab for this trip. This morning our tour leader will take us to explore Romania's capital, which a remarkable blend of turn of the century elegance and communist excess. Situated on the Danube Plain and set amid a series of lakes and spacious gardens, remnants of more gracious days still exist to charm the visitor. We visit many of the older parts of the city to see some of the buildings that have earned it the reputation as the 'Paris of Eastern Europe'. We also make a visit to the fascinating Village Museum, which has assembled wooden churches, windmills and peasant dwellings from different regions of the country. After the city tour we drive to Moieciu, which takes around three hours. Time allowing, you will have the opportunity to visit Pelisor Palace to see this fine example of an Art Deco and Art Nouveau interior. After the visit we continue to nearby Moieciu village where time permitting we can do a short walk in the Bucegi Mountain forests that are protected as a nature reserve. This walk covers a distance of approximately six kilometres and takes around two to three hours. It includes uphill and downhill sections along a cobbled path (300m ascent and descent). This walk is graded as Easy. Alternatively you can explore Moieciu at your own pace rather than taking this alpine walk. This evening we will stay in a quaint local guesthouse in the Transylvanian village of Moieciu, where we have a delicious home cooked meal this evening. Romanian cuisine is hearty and their red wine is surprisingly good. Before a meal the locals tend to sip the aperitif, tzuica, a strong plum brandy. Today we start our day with a short drive to the Bran Castle. The truth behind 'Dracula's castle' is even more fascinating than its myths! Earlier this century it was the home of the remarkable British born Queen Marie of Romania, granddaughter of Queen Victoria. Vlad the Impaler, the infamous 15th century ruler of Wallachia never lived here and there is no connection with the excellent novel by Bram Stoker - who never even travelled to Transylvania. Perched on a crag in a valley between two high mountain ranges, it controlled an international trade route, but is now a rural back-water. We drive to the city of Brasov that's old town still has its medieval walls, a town hall and several churches dating from the 14th - 18th centuries. There are also the ruins of an old citadel. Brasov is one of the most historic cities of Transylvania with its old buildings, cobbled streets and local atmosphere, all clustered within the medieval fortifications and overlooked by a magnificent 15th century Gothic cathedral. We have free time to have lunch and the option to visit the Gothic Black Church, which is considered by many to be the most important church in Romania. We then continue our drive for approximately two and a half hours to the medieval town on hill top, Sighisoara, a UNESCO World Heritage Site, where we spend about an hour. This is the birthplace of Vlad the Impaler. The town's colourful buildings encircle a central square where you can have a cup of coffee in a local café and watch the world go by. Alternatively you can climb up to the church and get a good view back over the town below. Our final drive of the day to Bistrita which takes us about three hours and we will arrive at our hotel in the evening. Leaving Bistrita this morning, we drive pass high forested hills and fertile valleys dotted with orchards and meadows. We reach the village of Sapanta about two and a half hours later and here we go to see the Merry Cemetery, a UNESCO World Heritage Site. Each gravestone includes a humorous caricature and short poem about the deceased. We also visit the Monastery of Barsana, which is one of the most photographed landmarks in the Maramures. The beautiful tall wooden church is 57 metres high and is a great example of the clever construction techniques used on these traditional wooden structures. At lunchtime today we'll have an authentic and hearty meal in a villager's home. Romanian cuisine is delicious and often includes things such pearl barley or polenta, fresh root vegetables and cabbage, stewed beef or pork, sour cream and home baked bread. This afternoon we continue our drive to Borsa, a small ski resort nestled in the Rodna Mountains. There are few settlements in Europe that remain so untouched that bears still roam freely in the forests. Today we enter such a region, as we take the narrow gauge railway from Viseu de Sus up the Vaser Valley to Novat. We chug slowly through the valley passing huge expanses of beech and spruce forest that echo with the sound of mountain rivers rushing through them. We then walk up a forested valley along lonely trails, enjoying the stillness and freshness of the forest. After a stiff climb of over 600m, we reach a ridge where there are spectacular views across the Viseu Valley. We descend through hay meadows and scattered copses to Moisei, where we meet our bus. This ridge hike takes approximately five to six hours, covers 16kms and reaches a maximum altitude of 1,400m (with a 500m ascent and descent). This is the most difficult walk on the trip and is graded as Moderate. About one hour of this walk is a fairly steep uphill section along a tractor track and depending on the weather it can be muddy and rocky underfoot. An easier alternative self-guided route is possible whereby you walk alongside the railway tracks (covering around 10kms, takes two and a half hours and is mostly flat with only a slight downhill section). If you don't wish to walk at all then you can explore the town of Viseu de Sus at your own pace or you can take a longer journey on the train. Rather than getting off at Novat you can pay an additional supplement to take the train to its final stop in Paltin. The train normally stops in Paltin for one to two hours. There's a cafe here and it's possible to take a short walk in the forest. You will then need to board the train back to Viseu de Sus to meet the bus. Please note that if the railway is closed then we will take an alternative route to walk in this beautiful area. Leaving Borsa by chairlift, we walk up onto the mountain ridge. We walk along the ridge top and if possible (depending on whether the shephards are on this mountain at the time) we will stop at a shepherd's hut where we may be invited to sample some fresh sheep's cheese, washed down with tuica, the fiery local plum brandy. This hike in the Rodna Mountains is graded as Easy and takes around two to three hours covering five to six kilometres and reaching a maximum altitude of 1,416m. There is a short steep unhill climb at the beginning of the walk followed by a long mild descent. If you don't wish to take part in the walk then you can remain on the bus and meet up with the group at the end point of the walk. 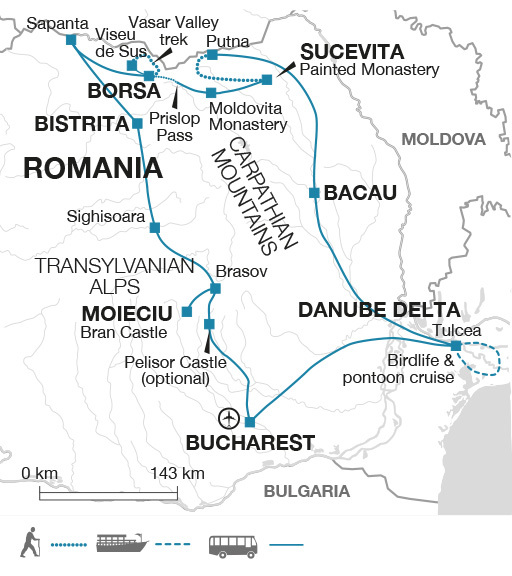 After the walk we meet our bus and drive east across the Carpathians to Moldavia and the northern region of Bucovina. Here we discover the remarkable medieval monasteries, founded during the reign of Prince Stephen the Great (1457-1504) and his successors. Whilst most Romanian churches have frescoes inside, what makes these so astonishing are the fantastic frescoes on the exterior walls. These vivid Biblical images were used to educate the medieval population in an exciting graphic fashion. Painted during the 16th century, the frescoes are a fusion of formal Byzantine style, with colourful folk art. The monasteries are now UNESCO World Heritage sites, but also house thriving religious communities of nuns and monks. We stop at Moldovita, which is nestled beneath the forests of the Obcina Mare Ridge. Among the most interesting scenes pictured here are the Seige of Constantinople and the Last Judgement. After spending about an hour at the monastery we drive up to the Ciumirna Pass and continue through the forest to our accommodation near Sucevita. We include a visit to Sucevita Monastery, the largest of the monasteries in the Bucovina region, with massive towers and stone walls protecting the inner buildings, which are decorated with portraits of historical legends and biblical scenes. There is an excellent small museum showing some of the treasures of the monastery, the most valuable items being 17th century embroideries, icons and gold work. We spend around one hour here discovering the monastery and museum. We then hike through the countryside along the forestry roads in a valley to the north of Sucevita. First we take a trail through the beech woods to emerge in a grassy valley dotted with the houses that form the rambling village of Putna, close to the Ukrainian border. The walk is graded as Easy with some Moderate sections and we have plenty of time to complete it. It covers approximately 16kms and takes about five hours. There's a short steep uphill climb for about 20 minutes in the middle section and then another short descent. If you do not wish to do the walk, then the bus will drive to Putna via Marginea where you may like to visit a pottery maker. At Putna you will meet up with the rest of the group to visit the monastery. We spend about one hour visiting the Putna Monastery Museum. It was founded in 1466 and is the oldest remaining in Moldavia. Inside is the tomb of Stephen the Great. Following our visit we meet our bus and drive for around four hours to Bacau where we spend the night. This morning we drive for about four hours to the ancient port of Tulcea, the so-called 'gateway to the delta'. Here we board our pontoon - a barge style vessel resembling a large house boat - that will serve as both our transport and our floating accommodation while in the Danube Delta. Though simple, it has a sun-deck and twin berth cabins on the lower deck. It provides us with an innovative and flexible way of seeing the abundant birdlife of the delta and visiting the tranquil and beautiful lakes hidden in the backwaters. From our pontoon we can also use smaller boats to reach the more narrow waterways and reedy channels. After all the exploring we've done by road and on foot so far during this trip, this is now the perfect opportunity to relax and enjoy the slower pace of life in this peaceful wildlife reserve. We will have dinner on board our pontoon this evening. The Danube Delta - over 4,000 square kilometres in all - is one of the great glories of Europe. It is a premier wildlife sanctuary and paradise for birdwatchers and photographers alike. We spend the day aboard the pontoon and smaller boats to give us the opportunity of viewing some of the many species which inhabit the delta. Apart from its rich wildlife, the Delta is simply a beautiful place to relax aboard our vessel. We make our way through a maze of channels fringed by vast reed beds and ancient willow trees. Whilst different birds are seen depending on the month of visiting, most people will see the spectacular White Pelican. Vast quantities of birds congregate here, including grebes, falcons, egrets, swans and cormorants. The marshy conditions make life difficult for the birds' terrestrial predators, making the delta an even more attractive haven and breeding ground for them. Much of this can be enjoyed from the sun deck of our pontoon. We will also take time to visit a village in the Delta. These are some of the most remote settlements in Europe and are far away from any roads. We will have all our meals onboard our pontoon today. We spend the morning cruising back to Tulcea, and after our last lunch on board we will drive back to Bucharest, which takes us about four and a half hours and we'll arrive in the early evening. You're then free to have dinner and spend your final evening in the capital. Today our trip ends at Bucharest after breakfast. If your flight is departing later today (departing after 3pm) or you are extending your stay in the capital then it may be possible for you to join a tour of the Palace of Parliament. If this is something you are interested in then please speak to your tour leader at the start of the trip and they can help you to check availability and book onto a tour. Pelisor Palace can be visited on day two; entrance is 25 Romanian Leu (RON) per person. To take photos inside there is an additional fee of 35 RON per person or 60 RON per person for using a video camera. The Black Church can be visited on day three; entrance is 9 RON per person. Vaser Valley steam railway for anyone not doing the walk there is an additional cost of approximately 40 RON per person to take the railway through to Paltin and to return to Viseu de Sus. On day 11 the entrance fee to the Palace of Parliament is 40 RON per person. Please note you must take your passport with you to be permitted entry. Please let your trip leader know at the beginning of your trip if you're interested in visiting this and they can help you to check availability and book onto a tour. Please note that since the Palace of Parliament in Bucharest is still an active government building that it might not always be open to visitors. July and August are the hottest months and lightweight cotton clothing is best. During spring and autumn temperatures can be lower or drop during the evenings and there is also a stronger possibility of rain, although light rainwear may be needed at any time of year. Layered clothing and a warm fleece are recommended for cooler evenings and in the mountains along with a windproof/waterproof jacket. We recommend taking spare walking socks and waterproof trousers for the included countryside walks in case of rain. Comfortable walking boots with good tread and ankle support are essential for the countryside walks as paths can be uneven and muddy. Trainers or sandals for general travel are also recommended. Bring a water bottle, insect repellent, sunscreen, a sunhat, a personal first aid kit and a torch (in case of emergency and it can also be useful for on board the pontoon boat). Binoculars are recommended for bird watching in the Danube Delta and walking poles for the countryside walks. Although entirely voluntary, tipping is a recognised part of life in this region of the world. Some local staff will look to members of the group for personal recognition of particular services provided. Accordingly, you should allow £15.00 for tipping of the driver and the boat crew. On days eight and nine of our trip we will staying aboard a pontoon, which a barge style vessel resembling a large house boat. It will serve as both our transport and our floating accommodation while in the Danube Delta. Though simple, it has a sun deck, dining room and twin berth en suite cabins on the lower deck. There is no Wi-Fi access or bar on board. The plug sockets within the cabins are only available to use when the boat's generator is on (usually between 06.00-10.00, 12.00-15.00 and 18.00-23.00). Our meals on board will be a set menu with drinks included and vegetarians can be catered for as long as we know in advance. It provides an innovative and flexible way of seeing the abundant birdlife of the delta, and allows us to reach the smaller waterways, reedy channels and tranquil lakes hidden in the backwaters. All the accommodation used on this trip (except in Bucharest) are on multiple levels with narrow staircases and no lifts, so we recommend packing as light as possible, as you will need to carry your own bags up and down the stairs. We walk on four days of this 11 day trip and these are mountain walks that are graded as Easy to Moderate. The walks do involve hilly sections and can be muddy and uneven under foot, so we therefore recommend taking comfortable walking boots with good grip and ankle support, spare walking socks, a water bottle and snacks, sun screen, insect repellent, sun hat, layered clothing (including waterproofs), a backpack and walking poles with you. On day two there is the opportunity to walk in Bucegi Mountains covering a distance of approximately six kilometres and taking around two to three hours. This walk includes uphill and downhill sections along a cobbled path (300m ascent and descent). This walk is graded as Easy. Alternatively you can explore Moieciu at your own pace rather than taking this alpine walk. On day five we take a ridge hike through the alpine meadows which takes approximately five to six hours, covers 16kms and reaches a maximum altitude of 1,400m (with a 500m ascent and descent). This is the most difficult walk on the trip and is graded as Moderate. About one hour of this walk is a fairly steep uphill section along a tractor track and depending on the weather it can be muddy and rocky underfoot. An easier alternative self-guided route is possible whereby you walk alongside the railway tracks (covering around 10kms, takes two and a half hours and is mostly flat with only a slight downhill section). If you don't wish to walk at all then you can explore the town of Viseu de Sus at your own pace or take an extended journey on the steam railway to Paltin before returning to Viseu de Sus to board our bus and go to meet the rest of the group at the walk end point. On day six we hike in the Rodna Mountains. This walk is graded as Easy and takes around two to three hours covering five to six kilometres and reaching a maximum altitude of 1,416m. There is a short climb at the beginning of the walk followed by a long mild descent. If you don't wish to take part in the walk then you can remain on the bus and meet up with the group at the end point of the walk. On day seven we walk to Putna which covers approximately 16kms and takes about five to six hours. This walk is graded as Easy with some Moderate sections. The walk is along forestry roads with a short steep uphill climb for about 20 minutes in the middle section and then another short descent. If you do not wish to do the walk, then the bus will drive to Putna via Marginea where you may like to visit a pottery maker. At Putna you will meet up with the rest of the group to visit the monastery. As well as the above walks the exploration of the towns and cities visited on this trip will mostly be done on foot, so that you can get a proper feel for all the fascinating places that are visited. We spend a couple of nights on board a house boat and exploring the Danube Delta by smaller boat, so in case of emergency it is necessary for you to be able to swim at least 25 metres. At some of the museums visited on this trip, where we have a guided tour, this may be with other non-Explore customers as the museum doesn't provide private guided tours. Need to be able to swim 25 metres. The Danube Delta is a bird-lovers paradise. The diverse habitats in and around the wetlands of the delta attract a huge and diverse selection of birds. During our spring and autumn trips, thousands of migrating birds make a stop here on their long journeys. Breeding season is generally in May, so there are higher numbers of birds in and around the delta at this time of year. The species of birds that we could see will vary depending on the time of year, but the white pelican is seen on most trips. We may also spot the pigmy cormorant; 80% of the world population make the delta their home. Egrets, herons, grebes, red footed falcons and white tail eagles are also possible to see.